The Jam Wireless Portable Speaker from HMDX Audio is a new entry in the wireless speaker market with a very attractive price of just $39.99. It comes creatively packaged in a little plastic jam jar and doesn’t come in colors, but in flavors. You can buy an HMDX Jam in Strawberry, Grape, Blueberry, Blackberry, Apricot, or Apple. Connect wirelessly via Bluetooth from up to 30 feet away with any Bluetooth enabled smartphone or tablet and most laptops. Connection is simple, with a passcode right on the bottom of the device next to the on/off switch and volume and fast forward buttons on the side of the speaker. There’s a micro USB port for charging (USB to micro USB cable included) and an audio in jack. Once you’ve got your speaker fully charged you can expect about four hours of play time from the lithium-ion battery. It’s fairly lightweight at 9.6 ounces and at just 2.5″ x 2.5″ x 2.5″ it can easily be tucked into a pocket or a bag for summer trips without having to worry about taking up space you need. The sound quality is a definite improvement over what you get with the speakers on a typical phone or tablet, although not quite as rich or deep as more expensive speakers. It easily fills a room with sound, and only at higher volumes does the quality start to suffer a bit. 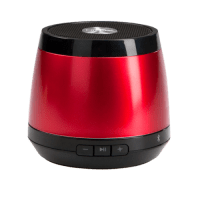 If you’re in the market for a well-priced Bluetooth speaker that’s easy to take with you anywhere, then the HMDX Audio Jam Wireless Portable Speaker is a great choice in any flavor.